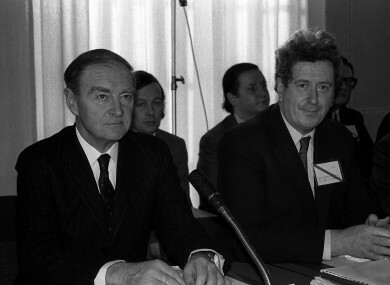 Garret FitzGerald (right), then the Minister for Foreign Affairs, with Taoiseach Liam Cosgrave at the talks that led to the Sunningdale Agreement. THE IRISH GOVERNMENT wanted Britain to withdraw troops from its NATO missions to quell what it saw as a Unionist ‘insurrection’ in Northern Ireland in 1974. A ‘desperate’ Minister for Foreign Affairs, Garret FitzGerald, pleaded with the US ambassador John Moore to ensure that the United States did not raise any objection if the UK was forced to reassign troops from NATO missions to deal with the hostilities in Northern Ireland. The call came after concerns about the implementation of the Sunningdale Agreement forced nationalists to make concessions about the implementation of the Sunningdale Agreement. The concessions, backed and recommended by the government in Dublin, had given new initiative to loyalist factions who had set up roadblocks in and out of Belfast. Because the Unionist parties could demand that Sunningdale be put to a referendum in Northern Ireland before being enacted at all, the Irish government privately feared that it could have ‘conceded everything’ in its bid to secure a share of power for northern Nationalists. The claim is contained in the latest tranche of US diplomatic cables published by Wikileaks, which includes a memo written to the US missions in London and Belfast and to the Department of State in Washington. FitzGerald had told the ambassador that the “orange card” was being played in Northern Ireland, and that London had done virtually nothing to stop the Ulster Worker’s Council (UWC) from taking “effective control of Belfast and much of Ulster” in May 1974. That council had called a general strike over the agreement, meaning that the SDLP’s concessions – concerning the timing of when the new institutions, such as a Council of Ireland, would come into effect – looked like a direct response to pressure from Protestant extremists. FitzGerald was concerned that the perception of success by the UWC strike would only fuel further attempts by unionists to pursue further action to delay the Sunningdale deal from coming into effect. The deal had been agreed in December 1973, but the UWC ultimately managed to force the entire collapse of the deal only days after FitzGerald’s meeting with Moore on May 24, 1974. Email “'Desperate' Ireland wanted Britain to send NATO troops to Northern Ireland”. Feedback on “'Desperate' Ireland wanted Britain to send NATO troops to Northern Ireland”.